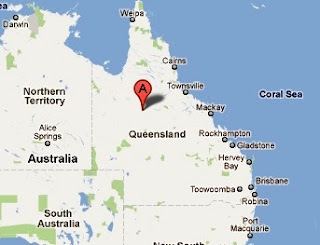 Queensland was a British Crown Colony that was separated from New South Wales on June 6th 1859. At the time, the area was called Moreton Bay. The area became the present Australian state of Queensland in 1901 when Queensland along with five other British Colonies united to form the Commonwealth of Australia. It is located in the North-Eastern section of the mainland bordered by the Northern Territory to the West, South Australia to the South-West, New South Wales to the South, and the Coral Sea and the Pacific Ocean to the East. Currently, the state has a total land area of over 715,000 square miles and a population of over 4.5 million. The name honors Queen Victoria who signed Letters Patent separating the colony from New South Wales. Queensland (Moreton Bay at the time) used the stamps and postal service of New South Wales until November 1, 1860. Queensland issued a number of stamps between 1860 and 1879 in the famous Queen Victoria Chalon Head design in different colors, denominations, perforation, and watermark varieties. Most of those stamps (Scott #1 to #50) are valued in the 100s and 1000s for Mint and somewhat less for Used. The first set was issued on November 1, 1860. The set (Scott #1 to #3) is very rare and catalogs in the $18K range for Mint and in the $4.5K range for Used. Certain used varieties of smaller denominations (Scott #24, #25, #38, #40, #44, etc) from later years are relatively inexpensive cataloging for a few dollars. The first stamps outside the Chalon Head theme was a set of five stamps released between 1879 and 1881 showing a head portrait of Queen Victoria in a different Common Design. The set (Scott #57 to #61) is also rare cataloging in the $550 range for Mint and $65 range for Used. A number of issues in that QV design along with a few other variations dominated the stamp issues of Queensland during the period till 1898. Chalon Head varieties were also issued in the 1882 to 1885 timeframe and then again in 1886. Those two sets (Scott #74 to #78 and #79 to #83) are both very valuable cataloging in the $1K and $750 range for Mint and about one-third less for Used respectively. Other QV designs from the period are much more affordable cataloging in the 10s of dollars range. Queensland also released a stamp in 1903 showing the ‘Australia’ allegory – a common design keytype with ‘Queensland’ and denomination overprints. That stamp (Scott #125) catalogs in the $30 range for Mint and around $5 for Used. Queensland stamps continued to be issued and used till around 1909. They were replaced by stamps of Australia. Several private token coins were used in Queensland from the mid-nineteenth century. Prominent ones include Copper Pennies of Brookes in Brisbane, J.W. Buxton in Brisbane, Flavelle Brothers & Company in Brisbane, T.H. Jones & Company in Ispwich, Larcombe and Company in Brisbane, Merry and Bush in Brisbane, T.F. Merry and Company in Toowoomba, D.T. Mulligan in Rockhampton, John Pettigrew and Company in Ispwich, J.Sawyer in Brisbane, etc. The tokens in VF fetch upwards of $50 depending on rarity. Loose Gemstones, especially Opal, old maps, historical photographs, etc are good collectible items of the area.